The Singapore Monologue Slam is open to anyone who is present in Singapore for the duration of the competition, except full-time employees, officers and representatives of Haque Centre of Acting and Creativity (HCAC) and Method Productions as well as the immediate family (spouse, parents, siblings and children) and household members of each such employee. The competition is open to all from ages 13 to 35 and any nationalities. What if I am above 35 years of age? We have an online competition for you this year! ​Please check the details here. No auditions are necessary; the first 60 participants to register will enter The Singapore Monologue Slam. Participants will perform a 1-minute character-based monologue in front of a panel of industry experts. The 5 top participants will be selected from Semi-Finals Day 1 to Day 3 to advance to the Grand Slam on Sunday, 24 September 2017. What happens if you are the Top 5? 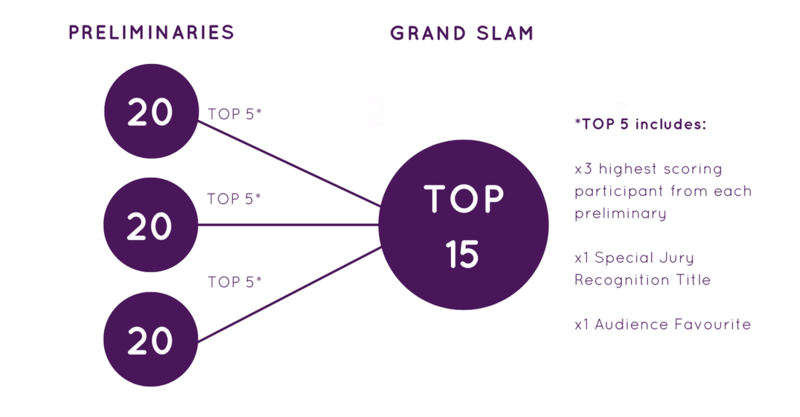 At The Grand Slam, the Top 5 finalists from Semi-Finals Day 1 to Day 3 will perform a 2-minute character-based theatrical monologue in front of a panel of industry experts. ​They will compete for the Best Original Monologue, *SCAPE Audience Choice Award, a top three placing and the coveted Singapore Monologue Slam Thespis Award. Judges will award blind scores based on a suggested rubric from SMS organisers. The Special Jury Recognition title is to be awarded to any of the participants outside the highest scoring thespian, based on open discussion and merit. ​The audience may vote any participant as their favourite performer for the night. The thing about theatre is that potential cannot be measured simply by a sheet of paper. Which is why, we've provided the audience a say. During each round, the audience will be given the opportunity to vote for the Overall Audience Favourite during intermission. The nominated performer, outside of the Top 3, will be given performer immunity. Allowing him or her the chance to advance into the Grand Slam together with the Top 5. Similarly for the Special Jury Recognition. Judges will be given the opportunity to choose their preferred individual, who will be outside of the Top 3, to be given a chance to advance into the Grand Slam. *Call time for performers is 6.00PM.